A review of Queuetopia: Second-World Modernity and the Soviet Culture of Allocation, by Andrew H. Chapman. This dissertation traces the formation of the queue as a response to material goods shortages from the pre-Soviet era through the 1980s. The phenomenon of the queue appears first in Russian history in 1896, according to the novelist Vladimir Sorokin, when thousands gathered on Khodynskoe Field to receive gifts from Tsar Nicholas II on the day of his coronation. At the turn of the century, when problems of food distribution would arise, queues would form together with riots over lack of bread. This active dissidence in the face of shortages became a major factor leading to the abdication of Tsar Nicholas II in 1917. After the Revolution, food shortages were again the root of the long queues that formed in shops and along the streets of Soviet cities, and Queuetopia focuses particularly on the food lines that arose concurrently with the implementation of the early Five-Year Plans. During this period in the 1920s and 1930s, large-scale manufacturing projects took top priority, and the production of consumer goods and foods occupied a distant second. Chapman’s dissertation explores representations of the socio-economic phenomenon of the queue right through the 1980s, when Soviet citizens would spend on average eighty billion hours per year waiting on line for goods. Meanwhile, the author points out, the same citizens worked half this number of hours in production. Chapman’s engaging socio-historical analysis provides the background for his treatment of the important Soviet fictional narratives about queue formation in society. The author draws upon the metaphor of the queue in stories and novels as a means to amplify the social, economic, and political histories of the Russian/Soviet queue. Specifically, he draws on Sorokin’s The Queue (1983), Venedikt Erofeev’s Moscow-Petushki (1969), and Yuri Trifonov’s “The Exchange” (1969)—novels in which lines for goods play a leading role. This important fiction traces queue formation to the Soviet Union’s practices of allocation and closely monitored distribution, but also keenly points out that the queue acquires its own rules and ways of operating by those inhabiting its space. While most scholarship about this period in Soviet history describes the individual as lost within the larger goals of industrialization and vulnerable to economic change, this dissertation locates far more important concerns about individual distinction within the socialist project. Chapters One and Two examine the queue as an inspirational source for bringing order to society. Chapman states that “the temporal aspects of queuing and waiting were appropriated by Soviet culture precisely to create spatial and social order, which emphasized that Soviet modernization could fairly, but not always equally, allocate the world that it created to its populace” (p. 18). Chapter Three observes queuing as a spatial practice, drawing on the theoretical contributions of Henri Lefebvre. The spatial structure in the everyday practice of waiting on line offers a narrative to be read for insights into the human experience of the Soviet era. Here, Chapman shrewdly adds to the spatial study of queuing the spatial language of gesture. Chapman draws on the theories of Michel de Certeau, who had compared pedestrian movements of walking and standing to the speech act: movements become a means of translating spatiality into the language of the body. As de Certeau writes, “The walking of passers-by offers a series of turns (tours) and detours that can be compared to ‘turns of phrase’ or ‘stylistic figures’…[and] The art of “turning” phrases finds an equivalent in an art of composing a path (tourner un parcours)” (Michel de Certeau, The Practice of Everyday Life, trans. Steven Randell. Berkeley: University of California Press, 1984, p. 99). Just as there is a rhetoric of walking, there is also a rhetoric of waiting, as Chapman points out. Carrying, facial mimicry, the backs of shoulders and heads, and the overall silent malleability of the line are the semiotics of gesture that provide insight into the human experience. As Chapman writes, “The city as text is read against its modernist grain: life is not synchronized with the cityscape: its spaces must be negotiated, navigated, and inhabited according to its inhabitants’ own rules” (p. 48). The order of the queue is self-policed through bodily communication and some verbal acts; order is kept by those standing in the queue through roll calls and personal favors so that the queue emerges as an autonomous structure within the server-client power structure. The body language of those waiting in the queue functions as a means of distinguishing oneself from the rest of the crowd. Within this seemingly austere server-client relationship, a notion of intimacy is created within the public realm. Chapter Four brings to light the hierarchical social distinctions within Soviet culture by drawing on Soviet and post-Soviet literature that negotiates conflicts between ideals of equality and the human desire for material possessions. Here again Chapman exposes the disconnect between abstract understanding of community ideology and lived practices through the lens of the queue in history and literature. He uses this analysis to elaborate on how society still managed to feel satisfied and productive even when operating in conditions of shortage. Chapter Five approaches the study of queuing from the angle of material culture. Specifically, this chapter elaborates upon how objects required new meanings and values through new forms of distribution and the rise of demand. Drawing on Walter Benjamin’s analysis of the fetishized object and the rise of consumption as applied to the “second world,” Chapman illustrates how strategic procurements and creative forms of consumption find phantasmagoric appearances and outcomes. In this chapter he argues that creative allocation and procurement of material goods in the Soviet Union provided unique individualized expressions to socially endemic problems. Once published, Queuetopia: Second-World Modernity and the Soviet Culture of Allocation has the potential to make a considerable impact on the field of Russian modernism studies by offering a counter argument to the popular understanding of this era’s preoccupation with speed and industrial development. Although most scholarship tends to ascribe cultural developments in this era to ideology and technical innovations of speed, this dissertation brings attention to the slower movements of waiting and the suspension of time that came with the grim reality of problems of allocation and distribution in the Soviet Union. After all, progress was measured by material, tangible elements, as the author points out. More important to the everyday happiness of Soviet citizens was the accruement of foods and goods, not the marvel speed of trains and cars around them. Moreover, Chapman brings to our attention the story “The Exchange,” by Yuri Trifonov, in which the hero, Dmitriev, stands out as a protagonist due to his passivity, reflective nature, desire for peace, and inaction. It is precisely during the hours of waiting that are built into his routine that he takes the time to contemplate the troubles to his life and devise solutions. In real life dynamics of this time, daily events happened in courtyards, jostling in trolleys, standing on line, and waiting in transient places such as stations. As Chapman writes, “The city’s automation, the speed and repetition of modernity, gives way to a static and cyclical, yet intensely lived space: those very same repetitions are no longer the crowning achievements of modernity, but are instead depicted as habitual, recurring features of everyday urban life” (p. 48). Druzhnikov, Iurii. Ia rodilsia v ocheredi. Tenafly, New Jersey: Hermitage Press, 1995. Dudintsev, Vladimir. Ne khlebom edinym. Moskva: Khudozhestvennaia literatura, 1968. Erofeev, Venedikt. Moscow to the End of the Line, trans. H. William Tjalsma. Evanston: Northwestern University Press, 1980. University of Pittsburgh. 2013. 236 pp. Primary advisor: Vladimir Padunov. 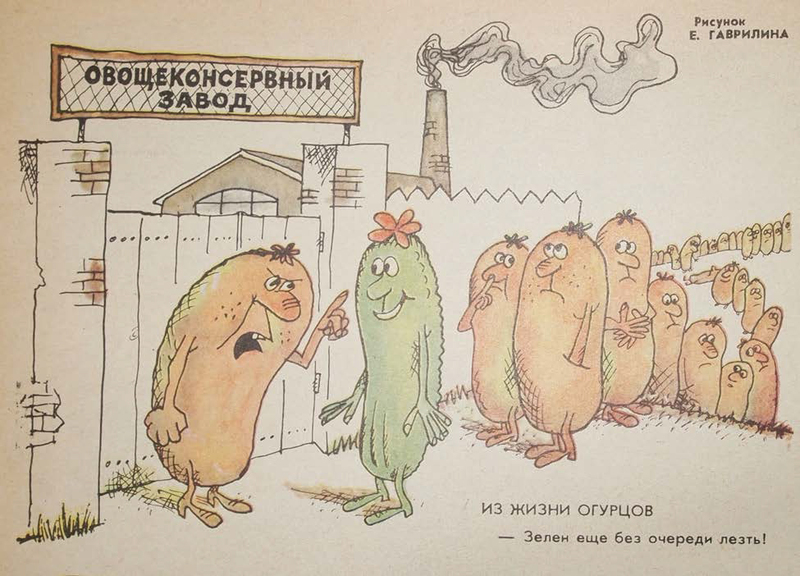 Image: E. Gavrilin, “Iz zhizni orgurtzov” (“From the Lives of Cucumbers”). Krokodil 29 (1978): p. 4.